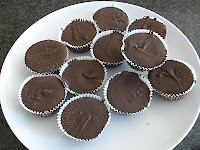 The Nut-Free Mom Blog: Sunbutter Cups from Cybele Pascal! A Delicious Treat for Any Season! Sunbutter Cups from Cybele Pascal! A Delicious Treat for Any Season! Because we have to give up so much of our Halloween candy bag, I try to make some special treats for both of my kids to enjoy. I realized that my oldest has never had a peanut butter cup, but she has developed a real taste for Sunbutter and her younger sister (without allergies) loves the stuff, too. I was so happy to come across this recipe for Sunbutter Cups in a magazine article, courtesy of cookbook author and allergy-friendly baking authority, Cybele Pascal. My husband and kids went crazy for these Sunbutter Cups! (And I admit, I nabbed a few myself!) They are so tasty and lots of fun to make with my daughters. If your child has food allergies, generally their candy bag is a little light after all the unsafe stuff is removed. I know Halloween is over, but these Sunbutter Cups are good any time of the year. How about making them when you have guests visiting over Thanksgiving or Christmas? If the kids are stir crazy, grab a jar of Sunbutter and whip up a batch of these little candies. I hope Halloween went well for everyone and now we enter the Thanksgiving and Christmas season. Stay tuned to The Nut-Free Mom blog for tips, advice and yes, more recipes. In the meantime, I'm getting myself another Sunbutter Cup before my kids get home from school! These look really yummy! Thanks for sharing...clicking over for the recipe. I've been making my own un-soy contaminated sunbutter. This is going to be one of my Christmas projects! Thanks for the idea! I found SunCups at World Market locally. They are made in a nut-free facility. Organic, gluten free, fair trade. I bought several in case they were unavailable next time. They also say Seth Ellis Chocolatier. My daughter prefers the milk chocolate to the dark. As a fellow mom, I appreciate the clever ideas to make these for Thanksgiving and other upcoming holidays. Thanks for a great post! My daughter (11) just tried for the first time Sunbutter. She loved it!!!! and I'm so happy because she said "mommy, I just feel like any regular kid". She eats it by the spoon, on crackers, and we are making our own sunbutter and jelly sandwiches tomorrow!! Rosalva, That's just what my daughter said to me. :) Glad she likes it! I'm happy to share good nut-free finds with my blog readers and SunButter is definitely one of them! Nut-Free Christmas Cookie Recipe: Snowballs!